What is the right plant for one application and climate is simply not necessarily the right plant for all, and this applies to selecting hedging plants. Choosing plants for hedges sounds easy, lots or articles will proclaim ‘this is the best hedging plant’ and this is particularly true of new releases. However with so many types of plants suited for both small and tall hedges the variety is almost endless and choosing the right sort of hedge plant can be a little difficult. It is the nature of the plant and its natural growing habit that need to be taken into account when selecting a plant to use as hedge. Along with a few other factors. We go through a check list of what to consider when selecting hedging plants. Here we are talking about the final height of the hedge. It is a little pointless trying to grow a very low hedge from naturally tall growing plants, a low border from evergreen magnolias is not likely to work, and neither is a tall hedge from lavender. Hedge heights range from .5m and less to 10m +. And of course the width, not much use planting a wide growing hedge in a narrow space. Now all plants actually flower, some just have bigger, and bolder flowers than others, some are perfumed, some are not. SO are you looking for the toy of hedge that flowers? Not much use trying to grow a tropical plant as hedge in Tasmania, or a temperate growing plant that can not handle humidity in the tropics. Some plants grow well in shade, others do not. How many hours of direct sun, and how many hours of good filtered light will the hedge get? Again this will influence your selection, it may be that you live in a naturally dry area, or that the soil is particularly free draining and does not hold moisture. Are you prepared to put in a drip irrigation system so that you can grow a particular type of hedge? 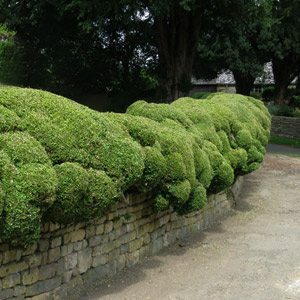 This is a big factor, if you are after a formal hedge, that requires clipping 2 – 3 times a year, be prepared to maintain it. If you are after allow maintenance hedge, then choose the right plants. Now here we are taking about the growing habit, do you require an upright type of hedging plant, one with a columnar or fastigiate habit. These are plants that naturally grow ‘up’ rather than ‘out’. And this can differ in the same species, for example, the cultivar Buxus sempervirens ‘Graham Blandy’ for example is an upright type, Box hedge, Buxus sempervirens itself is not upright. A number of factors come into play here, it is logical that smaller plants cost less, however in many cases different cultivars will also cost more or less as well, so ask the question, if you are after a camellia hedge, or a lavender hedge or any other, is their a different cultivar that is cheaper ?